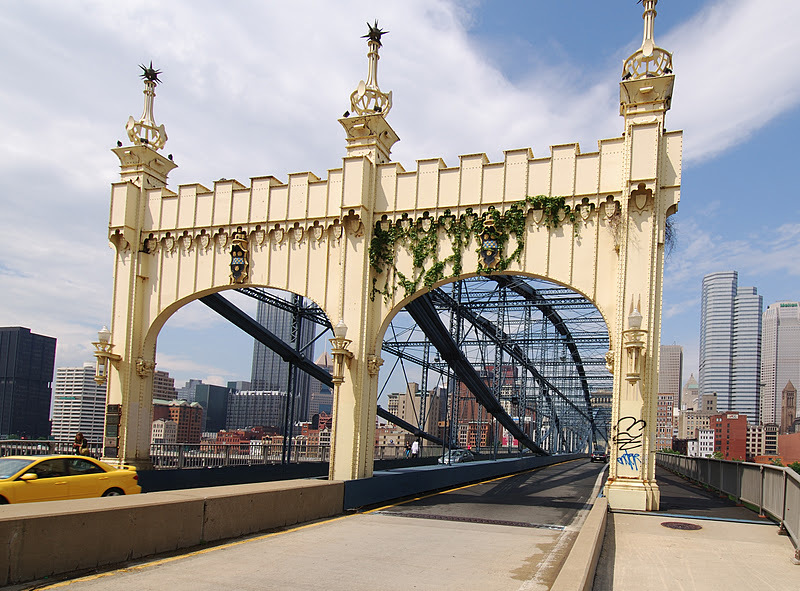 One last look at the Smithfield Street Bridge (with downtown Pittsburgh in the background). The portals at the ends of the truss spans are as well decorated as a Parisian bridge. The portal arches are supported by a worker holding a gear and a miner holding a pick. Above the arches are coats of arms, crenellation, and tridents. There's even some ivy growing (and the ubiquitous graffiti). The portals contain vertical elements that carry the dead and live loads from the trusses to the piers. There are also big laced members between the the top and bottom chords and smaller steel rods that support the deck (at the ends of the spans). Pittsburgh's Bridges: Smithfield Street Bridge (3) by Mark Yashinsky is licensed under a Creative Commons Attribution-NonCommercial-ShareAlike 3.0 United States License.